We are the Davidson Family and we live in Parker, Colorado. 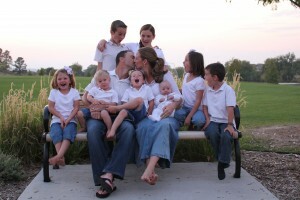 We are a home schooling family blessed with eight beautiful children and hoping for more! If you are like us, more than anything you deeply desire to encourage in your children a love for the Word of God and an understanding of the powerful truths it contains. Let me share with you a little of our history and how we came to create this site. Nearly nine years ago we decided, after much prayer and thought, to educate our children at home. At the time we only had three little ones and deciding to homeschool was quite a radical choice in our mind. Over the course of the next few years, God used that decision to open up our hearts to a very different way of thinking regarding the discipleship and training of our children – a more biblical way of thinking. Things in our life began changing very rapidly and God sent five more little blessing in quick succession! As we were simply trying to keep our heads above the water adjusting to these many changes we began to see our older two children growing and maturing right before our eyes. Along with this growth, we noticed a deep need to fill their minds and spirits with Truth and meat from God’s Word and not just simply fill their time while Mama was busy meeting the needs of the little ones. Things were easier when we first began this home schooling journey, but as more children came, and as we had to find more ways to fit them into our daily schedule, we became motivated to find ways for the older children to spend independent learning time productively. Our definition and understanding of education began to broaden as we realized that character had to be paramount in the discipleship of our children. 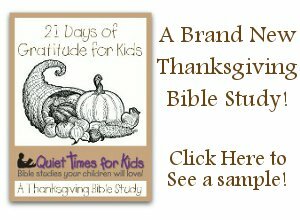 While we make it a practice to have a time of family worship reading the Bible together in our family, we also wanted our children to be spending time in God’s Word alone as well. Realizing these two goals in our family is what led us to create the product we are offering on this site. We hope and pray that the resources on this site will encourage and edify your family as you dig into God’s Word together!